The Recognition Programs Coordinator of iUniverse has informed George E. Matsoukas that his book, A Church in Captivity: The Greek Orthodox Church of America, is now part of the Reader’s Choice Recognition Program. Upon its publication in July 2008, iUniverse honored the publication with its selection as an Editor’s Choice book. The book is also included in the Spring Arbor database catalog of Christian Bookstore vendors. “First, (Mr. Matsoukas) recognizes that reversing this 20 plus-year journey into the abyss of disunity, autocracy, and ethnic purity, requires the combined efforts of hierarchs, priests, and laity. “The book is organized into twenty-three different essays each of which features a different topic which makes it easy to refer back to topics in the different sections. Also reviewed in The National Herald in February 2010: Click Here. 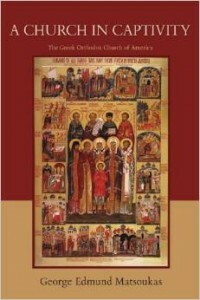 Another publishing milestone is Orthodox Christian Laity’s timely, just-published (May 2009) Orthodox Christianity at the Crossroad: A Great Council of the Church – When and Why. This book can help the reader understand the issues and background involved in convening the preliminary meetings that will take place in June 2009 in Cyprus involving representatives of the Autocephalous Orthodox Churches, but excluding the Orthodox Church in America This meeting is called by the Ecumenical Patriarch together with the heads of the Autocephalous Orthodox Churches to discuss and prioritize issues confronting Orthodox Christianity and develop an agenda for further discussions. This volume is for the general reader and raises questions relevant to Orthodox Christians living in geographic areas outside the ancient Roman Empire who are part of the living church in North America in the 21st Century. Both books can be purchased from the publisher: iUniverse (800-288-4777 / iUniverse.com); Light and Life Publishers, the Largest Orthodox Publishers in the World (952-925-3888 / light-n-life.com); Amazon (amazon.com); Barnes & Noble (bn.com).